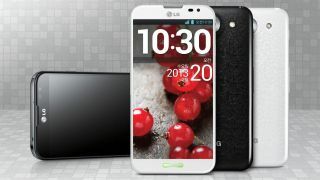 After the Korean firm cheekily teased the LG Optimus G2 during its press conference at MWC 2013 in Barcelona rumours surrounding its next flagship smartphone have ramped up. The latest information spotted by Blog of Mobile comes via a set of benchmark results which cropped up on Android app Antutu - a seemingly growing source of handset leaks these days. According to the reports three handsets have appeared on the app sporting the model numbers LG-F320K, LG-F320L and LG-F340L. While the F320L and F340L both appear to be running Android 4.2.2 and 2GHz processors, the F320K apparently sports a slower 1.5GHz chip and the slightly older Android 4.1.2 Jelly Bean software. Now there's no confirmation that any of these handsets are related to the mooted Optimus G2 smartphone and we'll probably have to wait a few months more before LG reveals its next fleet of phones. The original LG Optimus G was only launched last year, but it witnessed a relatively restricted roll out and has already been usurped by the Optimus G Pro - which also isn't available in every major global market. We hope that LG's next big smartphone will be further reaching than its predecessors and we lie in wait to see if it will be able to trump the HTC One, Samsung Galaxy S4 and rumoured iPhone 5S.